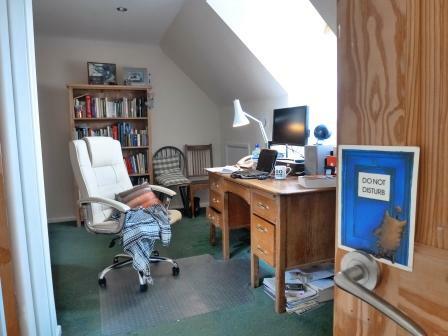 About a year or so ago, I put together a post on writer’s spaces (this is mine by the way, also operating as a planning literacy sessions, eating lunch, marking, editing, watching ‘Pointless’ and ‘Grand Designs’, dreaming and painting space… oh, and napping!) The cushion really has taken on the shape of my rear. 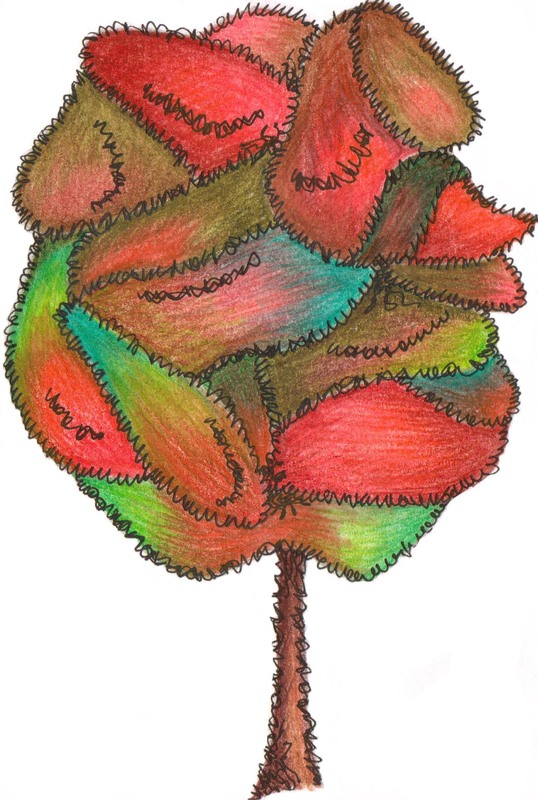 It is almost art! Anyway… I had intended to do a follow up post a few months later, but, well, you know how it is. So now, here it is, a little late but worth the wait methinks. I, for one, love to see where other writers work and what their prerequisites are. I think a lot of us just write where we can and that actually does the job! Thank you to Rachel Dove, Teresa Hamilton, Lil Chase, Kelly McCaughrain, Jane Howard and Philippa Francis, for letting me (and you) step into your world. All of these lovely writerly peeps can be followed on Twitter (see links below) and some have websites or blogs, details of which can be found on their Twitter bios. Enjoy! I would like to say that my writing desk is all clean lines, flowers and bookcases, but the truth is that I work from a corner of my bedroom, and often with a child or dog sat on my lap! I even have a linen basken doubling up as a small extra surface! I have bookcases in my dining room, but my writing desk is tiny. It is often littered with uni textbooks, scraps of paper with ideas on, and pictures of characters (the wolf picture on the wall is Ryker, a character from a series of stories I am currently working on). Recently, on a trip to Haworth, I stood in the actual dining room where the Bronte sisters created their masterpieces, and realised, it’s not the space that counts, it’s the people in it. 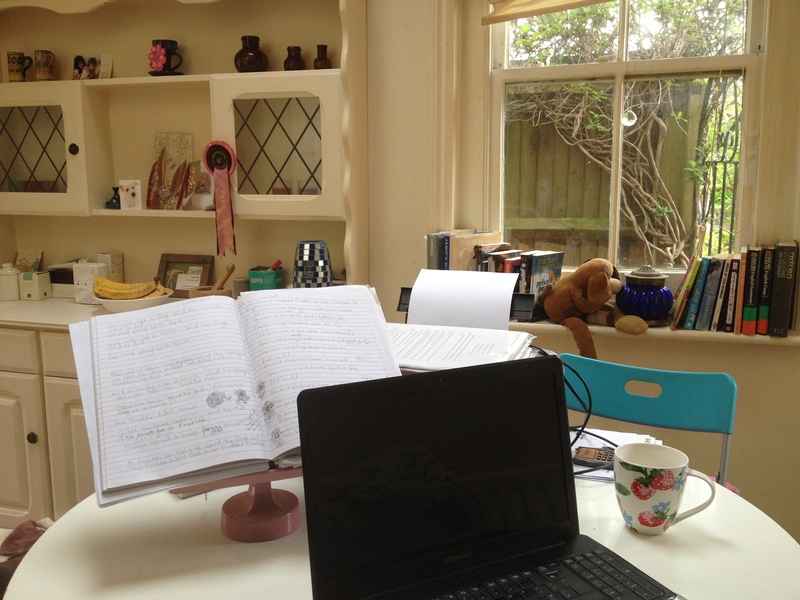 I love working inches from my family, and although I would love a bigger space, it’s a very much loved and heavily used little area, where I can work whilst my children sleep. Better than an office block any day. (Rachel has written ‘Crossing Life Lines’, published March 2013 and available from Amazon. You can find her on Twitter at WriterDove). I used to write in the study but when my OH, Nick, started working from home and moved his computer in beside me, it only took one day for me to realise that marital bonding had been taken to a whole new level. It was either him or me. So I scoured the antique shops in Lewes for a table and found myself a new writing position in the corner of our conservatory. It is part of the kitchen so there can be a lot of traffic but it seems to work. I have perfected the art of ignoring requests from the family; they know I will only grunt in answer to their questions when I am engrossed. I’d like to say I’m tidy. It always starts off that way but usually the paperwork from my e-store business, East is East, piles up on the window ledge beside me along with notes, reference books, mail, camera, pens, coffee cup and cat. Thank goodness the dog manages to stay on the floor. In all weathers I look out at the garden and South Downs in the distance and know that I am one lucky bunny to be able to do what I love the most in such a beautiful place. Oh, and talking of bunnies… they get more than a grunt if I look up and see them sneaking onto the vegetable patch. 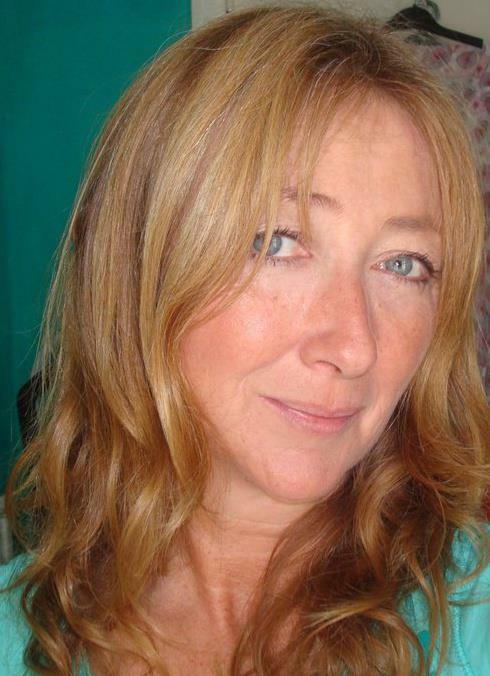 (Teresa has written ‘Choices’, published May 2012 and available from Amazon and ‘Love, Suzi x’ which is out in May 2013 and will also be available on Amazon. 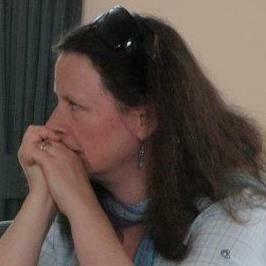 You can find her on Twitter at THamiltonwriter). 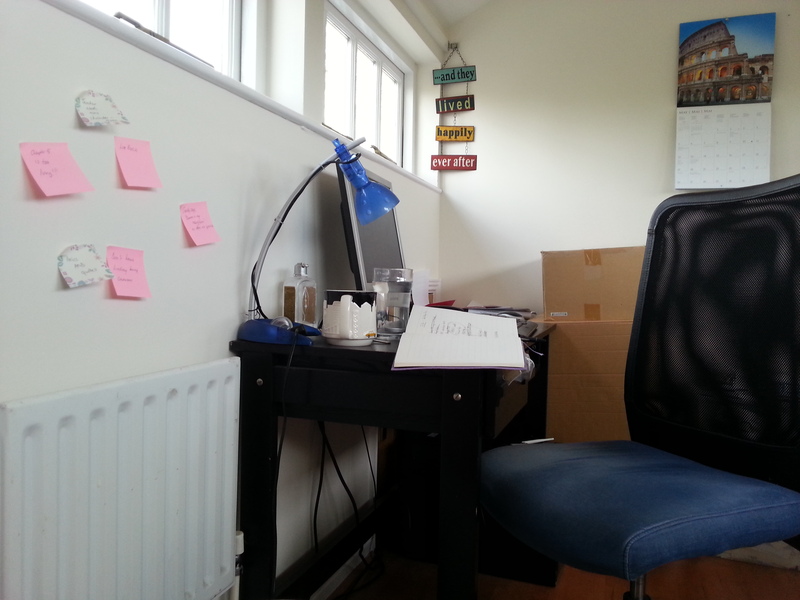 If my writing space looks like a storage room to you, that’s because it is. But, with space such a premium, I feel incredibly lucky to have this tiny area; enough for my desk, my printer, a very small bookcase, and tons and tons of natural light! I’m spoilt, I know. Notebook. I write straight onto the computer, but make a lot of notes as I go – asking questions, making character observations, things to come back to, etc. I should confess that I have an addiction to pretty notepads, once spending £18 on a single book! To-do lists. Two of them. There are so many things I need to get done – contact schools/bookshops, meet up with editors/agents, write blog posts (!) – and they all have different timescales and deadlines. I create a long-term to-do list, of things I have to do soon… but not necessarily now. Then every morning I list the things I need to do today. But the most important part of my writing space is the wall next to the desk. I need it for post-it memos. These are the things I must remember throughout my writing, while I’m writing. Things like, ‘Candy always asks questions.’ ‘Mum needs to feature more.’ They keep me in check as I go. Note the hanging in the back. It reads, ‘…and they lived happily ever after’. It’s not essential to my writing, and it’s not even a motto I stick to in my novels (neither book has a super happy ending), but it keeps me positive as I’m working. (Lil Chase is the author of ‘Boys For Beginners’ and ‘Secrets, Lies & Locker 62’, both published by Quercus and available from Amazon. Her new series – ‘The Boys’ School Girls’ – will be released in 2014. You can find her on Twitter at lilchasewriter). I have a fantasy writing room that I’ve been embellishing for years (I’ve been known to draw diagrams). By now it has bookcase-lined walls, leather sofa, bay windows overlooking the beach… I even know what’s hanging over the fireplace (poster of To the Lighthouse cover). But even in my fantasies I know this room is also empty 95% of the time – because I’m outside on the overlooked beach. I hate writing indoors. Whenever possible I sit in my garden, beneath the dappled shade of some unexpectedly rampant bamboo (which may have been a huge gardening mistake and is now taking over my shed). 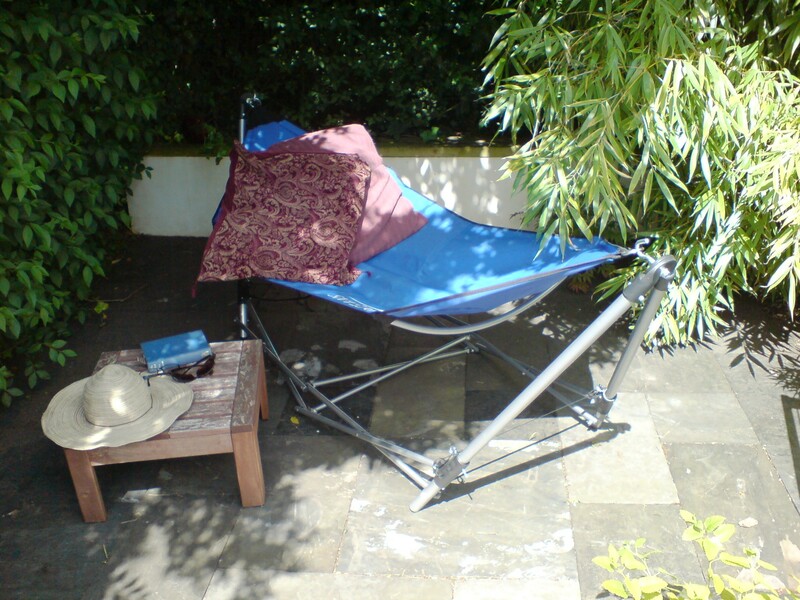 When I hit my afternoon slump, I roll over into my hammock and read beneath an enormous sunhat. Having been born in completely the wrong hemisphere, I’m more often found sitting out there under a parasol sheltering from the rain. I work entirely on my netbook, so I’m rarely surrounded by paper and pens, but my necessaries include a mug with a lid (to keep flies out) and a floppy sunhat. This summer I’m solving the weather problem by heading to France in my 1967 Campervan, Gerda. So for all you people moaning that your ‘office’ doubles as a living room/dining room/bedroom/kitchen – my office will be five square metres and comprise ALL OF THESE things. Ok, I won’t have the wall-sized notice-board my fantasy office contains, but I will have a 1960s Formica table, my kettle within arm’s reach, peace, quiet…and the knowledge that it’s raining at home. 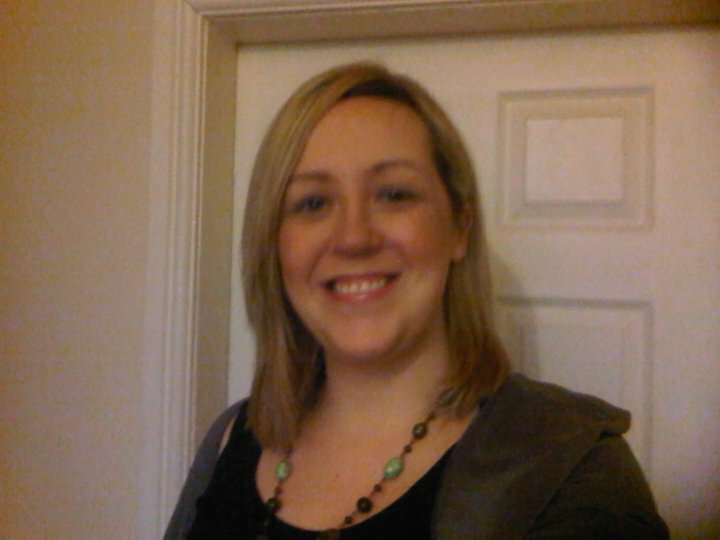 (Kelly is a YA writer from Belfast, Northern Ireland. 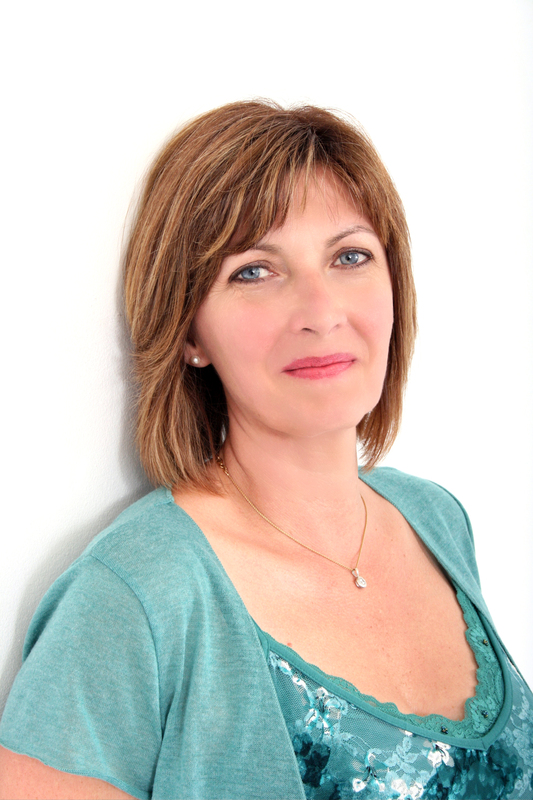 She was shortlisted for the 2013 Times/Chicken House Children’s Fiction Competition and is represented by Kirsty McLachlan at DGA. You can find her on Twitter at KMcCaughrain). I have roamed my cottage looking for somewhere where I’m not distracted. I used to write in my study, but it overlooks the South Downs and so, rather than writing, I found myself gazing out of the window. In the end, I opted for the kitchen table. The kitchen is my favourite room in the house. It has three windows and a skylight, so it’s bright and airy, and everything I need is within reach. The dogs lie at my feet, the coffee bubbles away on the stove, and I’m only a few steps from the garden and the garden gate. Dead heading and walking are my thinking activities. I work at my laptop, although I do sometimes write by hand. I spread everything out around me, and sweep it all away when someone comes over. Not an easy job because I often have teetering towers of paper and books balanced everywhere. 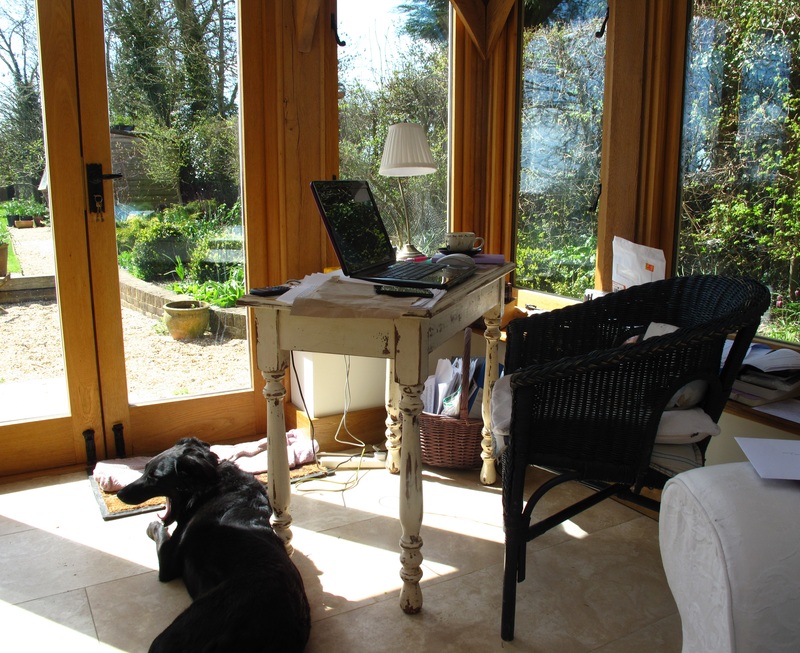 When I’m ‘pre-writing’, I might sit in one of two places and daydream; on a sunny day, this is in my specially created corner of the garden. When it’s raining, I sit in my old chair, back door open, and listen to the rain on the decking. 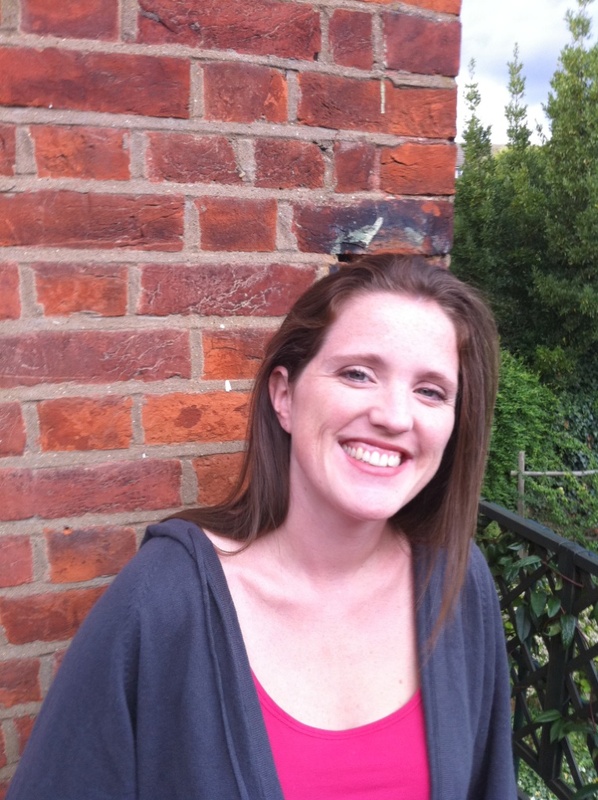 (Jane writes children’s comedy and is working on a middle grade novel and a young reader novel, which she hopes will be the first in a series. She has just completed her first picture book. You can find her on twitter at JaneHoward). I really am incredibly fortunate. 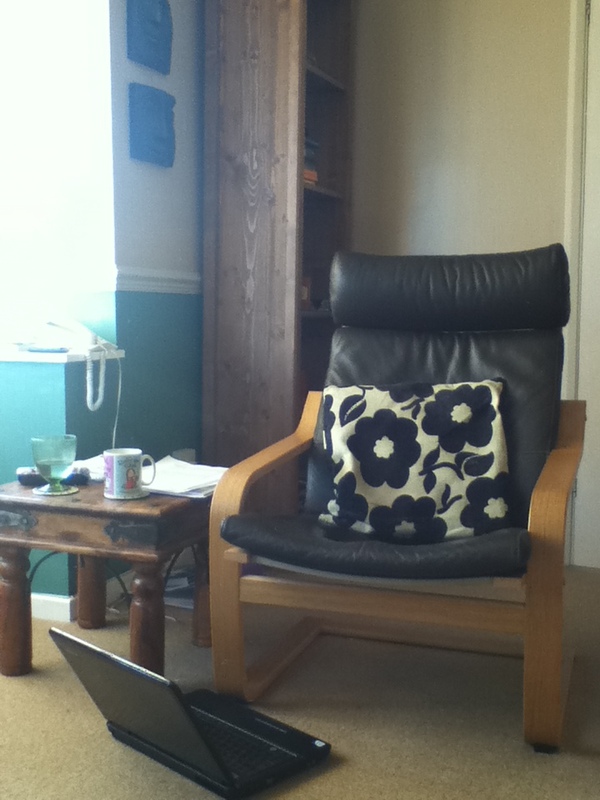 Now the children have left home, I have an entire ex-bedroom to myself – with its own loo. I have stuffed two large book cases – one bulging with How-to guides, dictionaries, thesauri and notebooks; the other with reference material. To give you a flavour – Rogues; Villains and Eccentrics is on the same shelf as the Smarties Joke Book; The Diary of a Farmer’s Wife 1796-1797 and A Field Guide to Demons rub shoulders further down. I write on a netbook which I plug into a large screen. That stands on an old attaché case so it’s just at eye-level. It’s a grotty old thing but it holds some poetry that was published years ago of which I am ridiculously proud – and rather hope will bring me luck. Two speakers act as bookends and general putting-things-on surfaces. Mostly I work with the sound of birdsong and the waves on the shingle outside. Gulls and air-sea rescue helicopters sometimes interrupt – or building work from neighbours. Then I deploy my CD of sea sounds. I have to unplug my ethernet cable to concentrate. There’s also a phone networked to my husband’s office in the garage. I often unplug that but the intercom’s handy if I want a coffee. He is a talented amateur barista. How lucky am I? (Philippa R. Francis writes as K. M. Lockwood. You can find her on Twitter at KMLockwood). Thanks again to all of the contributors. You may (or may not) have noticed, that all of these writers have a table on which to put their laptop… I have clearly taken the name ‘laptop’ literally. The coffee table by the side of my chair houses books, notebooks, a pen, water and my pen drive, and sometimes food! So, not only do I have a chair that is rear end-shaped, but I think I may have a lap that is laptop-shaped… and on that note… TA RA! That sounds lovely, Jo. I love writing on trains – always so much to see and write about. An fascinating and comprehensive post, Abi (even though they are not as frequent, they are still worth waiting for). I’m intrigued about the laptop on your lap – doesn’t it get uncomfortable with the fan blowing hot air at your thigh? I may have mentioned before that I am the only member of my household without a dedicated space to work in. 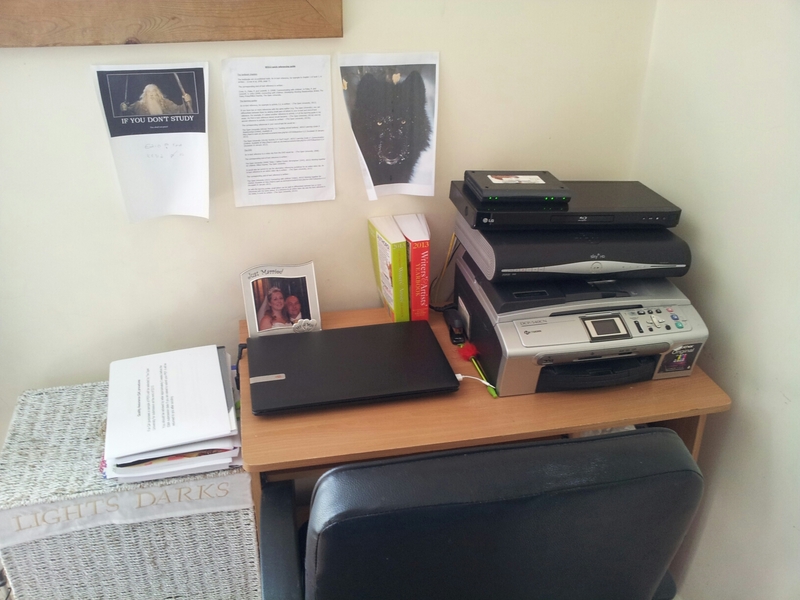 So I constantly hot-desk around the house – I think it goes with my own internal self-doubt about the worth of my writing, so I still tend to come last. So maybe this is the start of a permanent space for me too. I love seeing where and how other writers work — this is a fabulous post, Abi!! I had seen your request and wanted to submit myself, but ran out of time…thank goodness because my areas (two!) are BOTH far messier than any in this post! I must say they all look gorgeous and I am particularly envious of the campervan in France. SIgh. What can I say but WOW? I have romantic visions of writing outside, but I always get sidetracked…and the garden’s a mess! I’d love to sit on the beach, with a breeze in my hair and the ocean in my ears and write, but the vision in my head wouldn’t match reality…pages blown away, sand in the laptop keyboard…so, instead, I huddle up on my two-seater sofa with my laptop (with a fan beneath as it burns my legs otherwise! see Martin’s comment!) and spread my bits and pieces out on the spare chair beside me…I like to write in the comfort of my living room, with my shelves of books and aestheticky (I know that’s not a word…) things all around! Gerda’s so flattered by all the lovely comments! She does seem to make friends wherever she goes. Highly recommend the campervan/office. If your neighbours are noisy, you can move your house! I did this on my blog, too, a few weeks ago. So cool to see where we all write!